It’s difficult to feel too sorry for George Clooney; after all, he’s a highly respected movie star, humanitarian, filmmaker, activist, co-founder of a tequila brand worth $1 billion (no, seriously; look it up), married to an influential human rights lawyer, recently became a father to twins, and those are just a small fraction of the things he’s accomplished. But even so, after seeing his latest directorial outing Suburbicon, there is a great level of sympathy that deserves to come his way, because going by this and his previous film as director The Monuments Men, he doesn’t seem to have a whole lot of luck with getting potentially solid projects off the ground, since not only did The Monuments Men flop hard with both critics and audiences despite a fantastic cast and promising story (neither of which it fully utilised), but now Suburbicon is another baffling misfire that doesn’t seem to have any idea what it’s actually doing. Adapted from a long-buried script by Joel and Ethan Coen (with re-writes courtesy of Clooney and Grant Heslov), the film is set in an idyllic 50s suburban town which, despite labelling itself as “the melting pot of diversity”, throws its hands up in outrage when an African-American family moves into the neighbourhood. While the whole town is focused on this problem, they are oblivious to the much more serious manner just down the road; family man Gardner Lodge (Matt Damon) has hired mobsters to stage a home invasion and kill his wife Rose (Julianne Moore) with an overdose of chloroform, a plan he pulls off with the help of Rose’s identical twin sister Margaret (also Moore), but the suspicions of Gardner’s young son Nicky (Noah Jupe) lead to everything getting wildly – and violently – out of hand. The fact that this was originally a Coen Brothers script is one that you can tell almost right away, given some of the dialogue that sounds very Coens-ey, and the mild-mannered nature of people who would end up committing several disturbing acts of violence. Apparently, they wrote it shortly after their debut feature Blood Simple in 1986, and some of the unused plot elements from this they would later use in films like Fargo and The Big Lebowski; and ironically, now that it’s finally been made, it feels very familiar with those films that were released way after the script was first written. Watching it, you’re just reminded of how the Coens did these plot points much better in other scripts, and how the basic set-up of darkness in suburbia has been done much stronger and fresher in films like Pleasantville and Blue Velvet, and even if the Coen did direct this instead of Clooney it would definitely be one of their weaker outings, because it would have felt very much like they were treading on old ground. Clooney, however, has added a slightly bigger problem to the script he’s adapting; the racism sub-plot was apparently inserted by Clooney and Heslov in response to the growing anger and frustration in modern-day politics, and while I get what they’re trying to do with it – the whole town is blinded by their own racist hatred that they’re blind to the real crime just a few doors down – it really makes the film feel extremely unfocused. Since the main plot is of Matt Damon’s family problems (to put it mildly), whenever it cuts to this other plot involving the entire town ganging up on this one family just for being black, it’s often out of nowhere and seems to add nothing to the main plot, other than it’s there just because Clooney was angry at this kind of racism still existing, I guess. Not only that, but it is also so underdeveloped a lot of it feels like an afterthought; the family themselves are barely characters in their own sub-plot, and it’s ironic that they are so neglected by the writers here when in the film they are also barely able to make their own case in this white-dominated environment (which could very well have been the intention, but still…). There are even times when in scenes focused on the main plot, you can hear the angry chants of the racist mob faintly in the background, which could very well have been there for darkly comedic effect but for me just made it a bit more difficult to focus on what was actually happening in the foreground. It’s a perplexing failure in both its unbalanced script and also in how Clooney makes it look on the screen; nothing about the sets, cinematography, costumes etc really stands out, and the likes of Damon and Moore are rather noticeably miscast in roles that they just are not able to convince in. Only Oscar Isaac, who shows up for a couple of scenes as an insurance claims investigator, seems to be having the most fun on-screen and you find yourself just wanting to watch this guy’s escapades for a couple of hours instead of the uninteresting suburban stuff we’re actually getting, especially as it goes down the dark and violent path you’re expecting it to take, and does so with a disappointing blandness to itself. Again, it’s difficult to really feel sorry for Clooney, not least because he’s directed some pretty solid films in the past, but given how his past couple of projects have turned out, especially the perplexing misfire that is Suburbicon, he must be pretty bummed that he just can’t catch a break behind the camera, even when he’s working with material by the Coen Brothers. Poor guy, indeed. 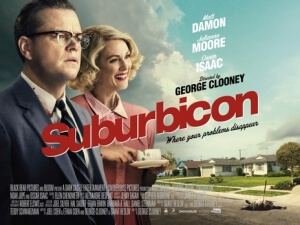 Suburbicon is a perplexing misfire from director George Clooney, who despite working from material by the Coen Brothers ends up making it an unfocused mess that never figures out what direction to take, and ends up looking rather lost in its own quirkiness.